Microsoft has begun promoting its new Edge browser using its Bing search engine, copying a practice already used by rivals. Just as Google's Chrome and Mozilla's Firefox have been pushed by the Google and Yahoo search engines, Edge now is both being touted as the better browser when users of Windows 10 search for those two competitors on Bing from Edge, and pitched as a replacement for them when the same users search for "chrome" or "firefox" on Bing as they run either of those browsers. Microsoft also uses the banner when Windows 10 users run Internet Explorer 11 (IE11) -- which is bundled with the new OS alongside Edge -- to search Bing for "chrome" or "firefox." With the banner, Microsoft appears to making a last-ditch effort to stop Windows 10 users from switching to Chrome or Firefox. While the immediate impact of the plea may be questionable -- presumably those searching for for an alternative had already made the decision to download and install another browser -- Microsoft may simply be planting doubt in the minds of potential switchers, and thus hope to regain Edge users if they're dissatisfied with their new choice. A second promotion appears when Windows 10 users running either Chrome or Firefox search for one of those two browsers on Bing. In those instances, a message reading, "Try the browser for Bing & Windows 10. Microsoft Edge is here. Go now," displays above the summary snapshot at the right of the Bing results. Again, the impact of this try-Edge message is questionable, since both Chrome and Firefox default to non-Bing search providers -- Google in the case of Chrome, Yahoo for Firefox in the U.S. -- and so are unlikely to be searching on Bing in the first place. Interestingly, Microsoft does not further promote Edge with a banner or message when Chrome or Firefox users search Bing using the string "Edge browser." None of these promotional efforts is out of the ordinary for a search provider with an interest in pushing a particular browser. Google intermittently pitches Chrome when users call up google.com from a rival browser, and it has run other promotions there as well, including one last year beseeching Firefox users to switch back to Google as their preferred provider after Mozilla adopted Yahoo as its browser's default. Yahoo has done the same since it struck the deal with Mozilla late in 2014. When an Edge user in Windows 10 goes to yahoo.com, for example, the message "Upgrade to the new Firefox" displays at the far right of the search site's toolbar. Because Microsoft's Internet Explorer (IE) browser has long dominated the browser space -- Net Applications pegged IE's user share at 52% for August -- the Redmond, Wash. company has had little motivation to pitch IE via Bing. But being new and a departure from IE, Edge is different: In effect, Microsoft is starting Edge's share from scratch. Microsoft obviously feels it must promote the browser as it positions Edge as the future and relegates IE to legacy support work. And there are signs that it is smart to do so. Although Microsoft has some substantial weapons in its Edge push -- notably that Windows 10's post-installation setup sets Edge as the default, even if the user had previously selected an alternate in Windows 7 or 8.1 prior to upgrading to 10 -- third-party measurements have hinted that Edge is being used by a minority of people running Windows 10. According to Net Applications, Edge was used by 39% of all Windows 10 users last month. Another analytics firm, Ireland's StatCounter, pegged usage share, a measurement of online activity rather than an estimate of the number of users running a specific browser, even lower for Edge: Just 14.5% of all Windows 10 online usage during the last seven days of August. If those numbers are accurate, it's no surprise that Microsoft is now promoting Edge. Microsoft has banked on revenue from Bing -- the default in Edge -- to replace some of the money lost as Windows license sales fall. In late July, David Pann, the general manager of the Bing Ads group, told online advertisers that Microsoft expected a 10% to 15% jump in Bing's search queries by September because of Windows 10. After SearchEngineLand.com reported on Pane's comments, Microsoft pulled the blog post where Pann outlined the anticipated bump in Bing usage. 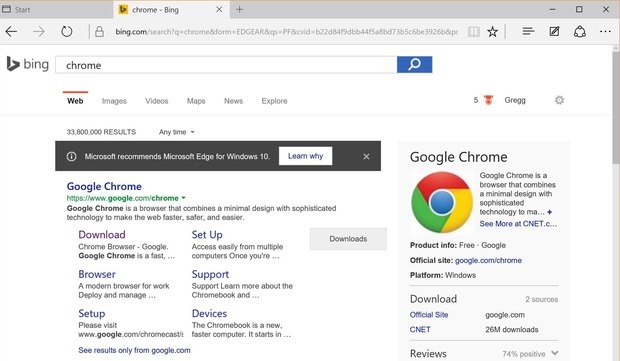 When Windows 10 users running Edge search for 'chrome' on Bing, they see a last-ditch banner that hopes to make them hesitate and abandon their download plans.